Germany, Part I. Germany, Part II. In 1848 the March Revolution swept through europe, in particular Germany. 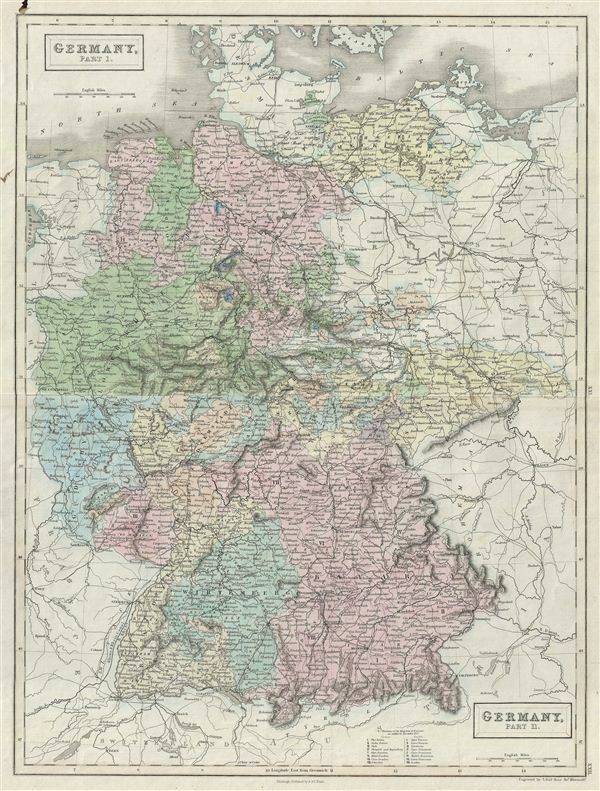 These Revolutions were nationalist pro-German, pan-German, declarations of discontent with the archaic autocratic political structure that dated to the 39 original German states established under the Holy Roman empire. The years following the violent suppression of the March Revolution saw a vast middle class exodus from the German states to the United States, leading to 'Germantown USA,' and popular interest among Americans in the Fatherland. Throughout, the map identifies various cities, towns, rivers, lakes, roadways and an assortment of additional topographical details. Map is hand colored in pink, green, blue and yellow pastels to define boundaries. The map is engraved by S. Hall and issued as plate nos. XXI and XXII in Black's General Atlas. Very good. Overall toning. Original platemark visible. Minor stains overall. Verso repair along centerfold.